The design layout demands on a technical flapping wing-among other things-results from the theoretical distribution of lift based on Robert T. Jones (USA 1950 and 1980) and the therefore necessary angle of incidence along the wing semi-span. Here, for example, the relevant, extensively optimised functional distributions for a gently inclined flight of a rectangular flapping wing with the all-round airfoil CLARK-Y are shown (principles please see Handbook). 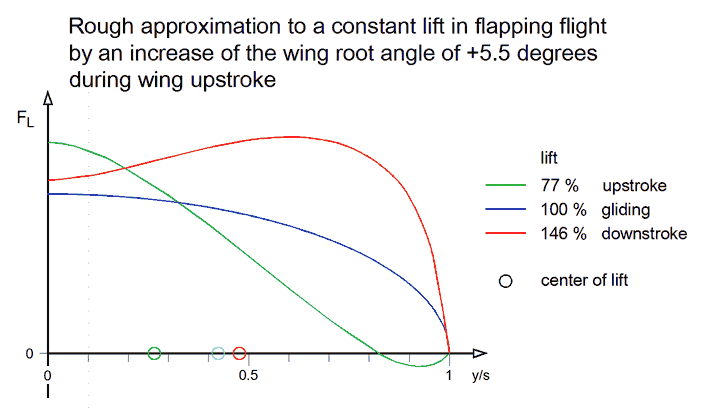 In this case, the angle of incidence at the wing root remains constant during the whole flapping period. 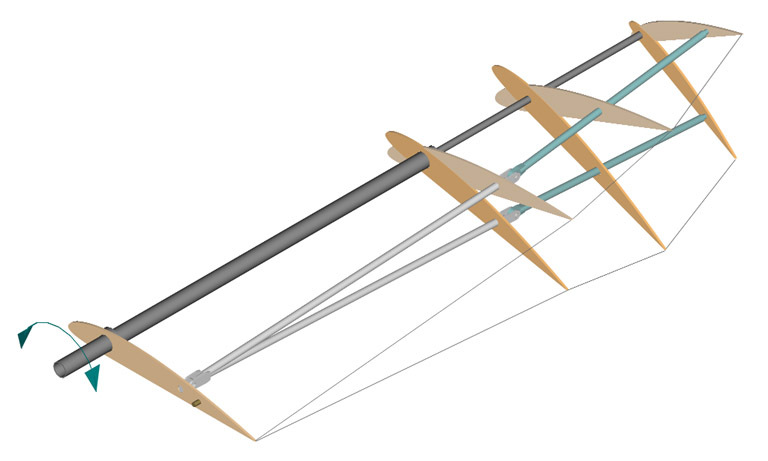 The distributions of the downwash angle along the span are straight-lined in all three cases (please look at the diagram downwash distributions on the wing). The weight of the flapping wing should of course be small. The same applies to the moments of inertia around the axis of the flapping wing. This plays an important role during acceleration in the end positions. There are recent findings about flying with relative constant lift resp. with wing rotation during upstroke. If one is concerned with the construction of a flapping wing, one should also get to know the advantages and disadvantages of this way of flying. In particular, the horizontal flight can be improved by the wing rotation, please see Schlagflügel mit und ohne Flügeldrehung ( Flapping wing with and without wing rotation , in German, PDF 0.7 MB). 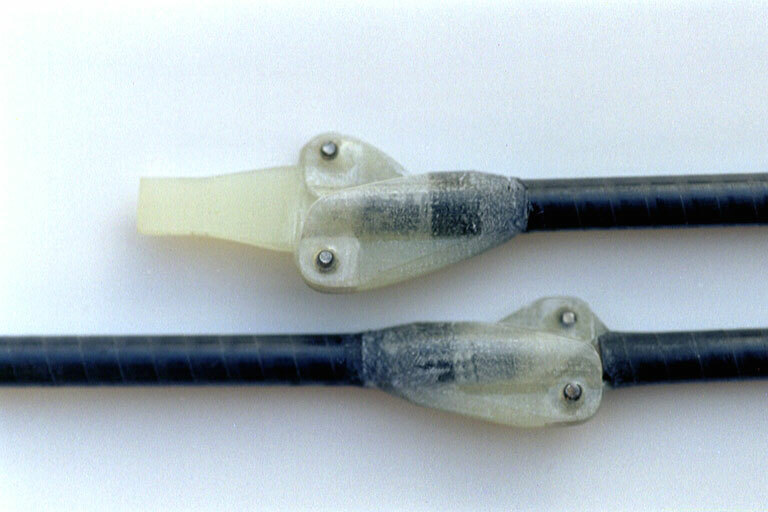 with an articulation for an additional flap motion of the hand wing spar. This is pulled down by a spring (spring device here not shown, please see Articulated flapping wings, in German, PDF 1.3MB). 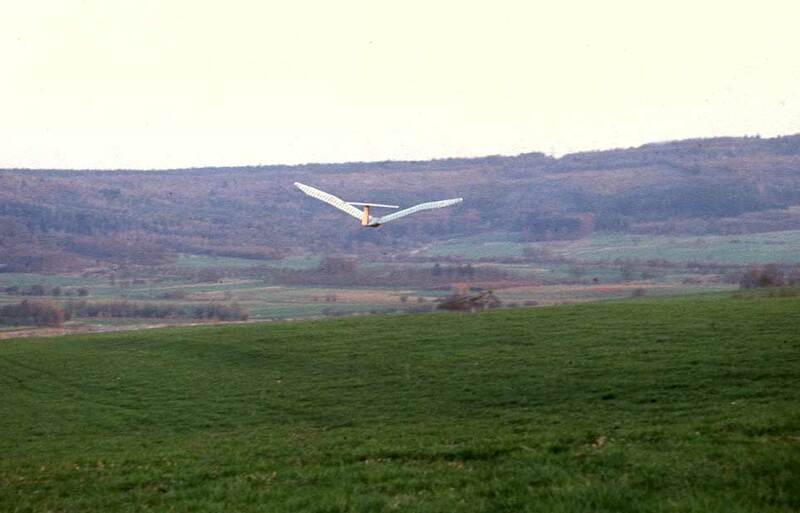 While gliding flight with its medium lift force, the hand wing takes over the stretched center position. On downstroke in the hand wing area the lift forces distinct increase and the hand wing strokes up against the spring force. 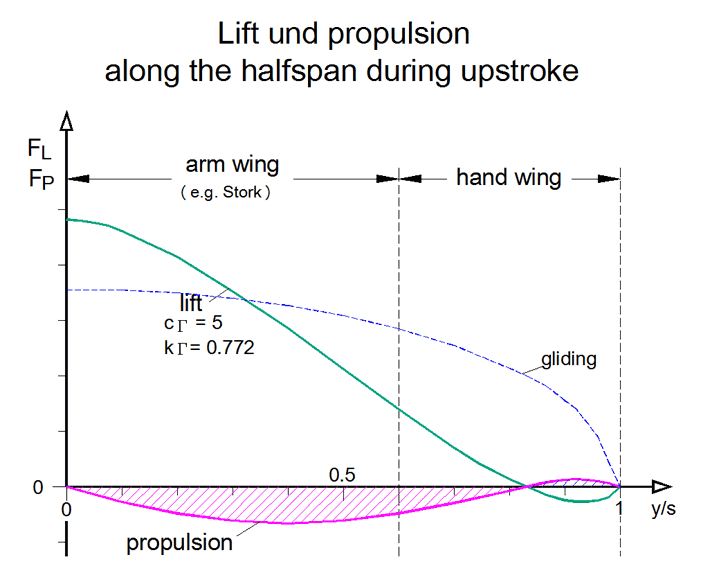 If on upstroke the lift forces decrease the spring force pulls down the hand wing. The small, on aerodynamic forces dependent and thereby aeroelastic stroke motion of the hand wing will be used by levers (brown for arm wing, green for hand wing) to control the twisting along the whole wing. 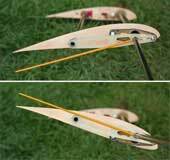 In this way an articulated flapping wing with aeroelastic controlled twisting has been developed. With the exception of the wing root rib all ribs are put freely rotatable on the spars. For the covering of the flapping wing the highly elastic polyurethane film Platilon U 04 is planed (please look at related link 1). The mode of operation of this articulated flapping wing, with its wing twisting by wing bending against the stroke direction, resembles a little to that of a bird's wing. In the case of the birds however, the rotating or twisting movement of the hand wing is mechanically coupled with its pivoting motion to the rear (please take a look at the book Anatomie und Flugbiologie der Vögel by K. Herzog and the paper Lift during wing upstroke, version 10.0, 2015 - 2018, PDF 1.0 MB). The yellow lever shows the rotation of the hand wing. 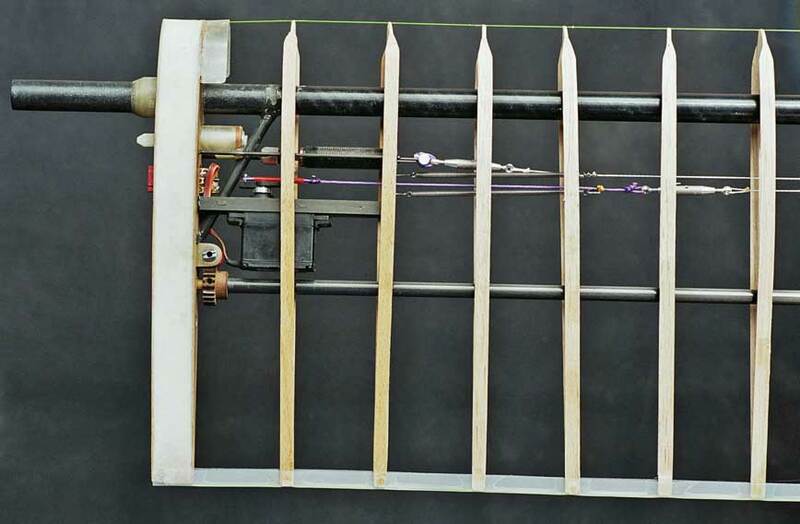 The principle of this aeroelastic controlled articulated flapping wing I have developed in connection with the flapping wing model EV6 (1983). It has been continually improved and applied in the subsequent models. By splitting the flapping and twisting tasks of a flapping wing on a main and an auxiliary spar its twisting moment can be designed adjustable. Adjacent, the framework configuration of an aeroelastic twistable flapping wing with an adjustable twisting moment becomes obvious. The adjustment is affected by the torsion lever at the wing root. The rest of the other ribs not shown here are fixed to the spars rotating freely. The covering is done with an elastic foil or according to the Shearflex principle. Also shell and foam wings can be designed adjustable this way. If you apply this system on a non-flapping aerofoil, a propeller blade or a wind turbine blade, their twisting can be controlled by the auxiliary spar. Generally, the different types of wing systems can be combined together in many ways. In the adjacent picture for example, the auxiliary spar of the arm wing with its torsional elastic force is used as a spring device for the small flap moving of the spar of the hand wing of an aeroelastic controlled articulated flapping wing. The arm wing torsion linkage (AT) and the arm wing auxiliary spar (AHi) are hereby fixed firmly together. 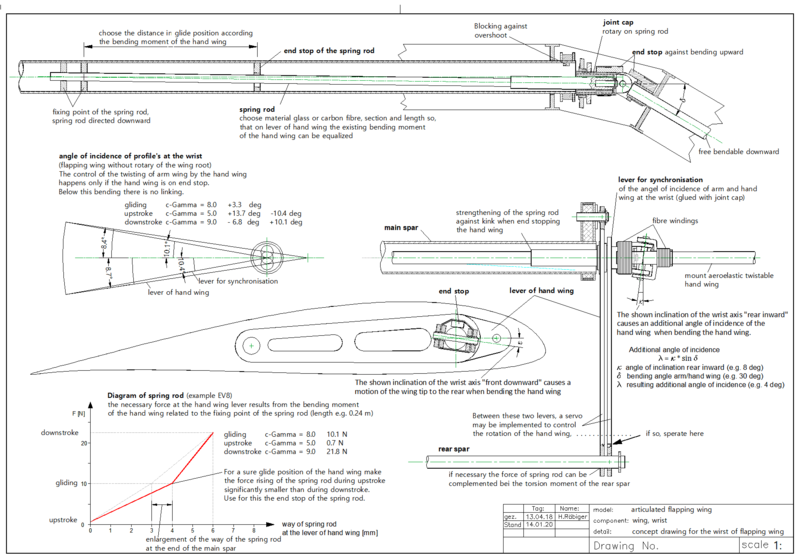 This way, the auxiliary spar-torsional moment will be transformed into a torque of the torsion linkage (AT). This is pivoted at the front and presses down the spar of the hand wing in the indicated rotary direction. 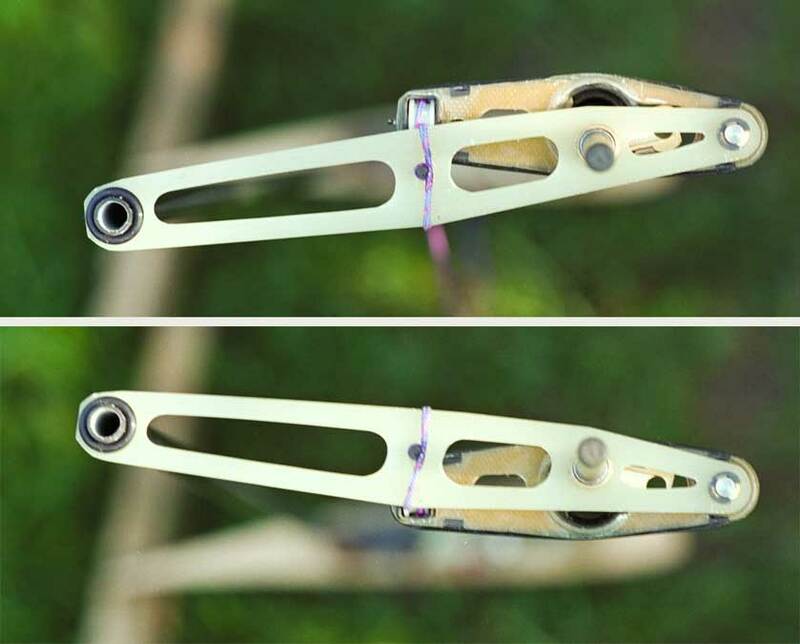 The pressure will be adjusted with the inlying lever (InH) at the wing root. The profiled arm part of this articulated flapping wing can also be combined with a membrane hand wing. This may be a flapping wing design for medial climbing and useful gliding flights. Adjacent, the wing mechanism near the fuselage with the setting mechanism of the turning moment of the auxiliary spar, the damper of the wing twisting at the upper final wing stroke position and the servo to keep the wing twisting in glide position. in short form called shift spar . This mechanism can be used at main and at auxiliary spars of flapping wings. 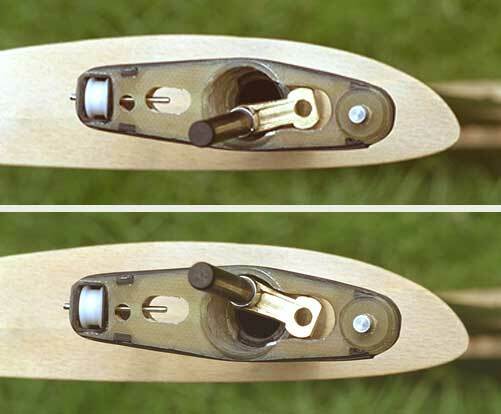 If the shift spar is used as a rear auxiliary spar, it can be used to increase the wing twist in the range of the wing tip. The left hinge here provide as basis. At a stroke moving of the middle shift linkage - here downward - the outer right spar section implements expanded stroke amplitude. with different center distances for transmitting the flapping motion (1:1.5). Adjacent one can see the spar framework of a profiled flapping wing for active wing twisting at the arm wing section by main spar rotation. 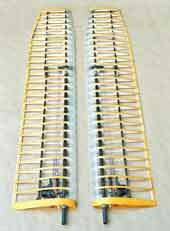 There is a stroke amplitude expanding auxiliary wing spar is used. In doing so the twisting at the hand wing section is increased. The spar shift linkage is hereby mounted coaxially. The rib at the wrist is fixed firmly to the main spar and the auxiliary spar hinges fixed firmly to the wing root rib. All the other ribs are stuck on the spars rotating freely. The covering is done with an elastic foil. For a passive or aeroelastic twisting the rib at wrist should to be pivoted on the main spar. 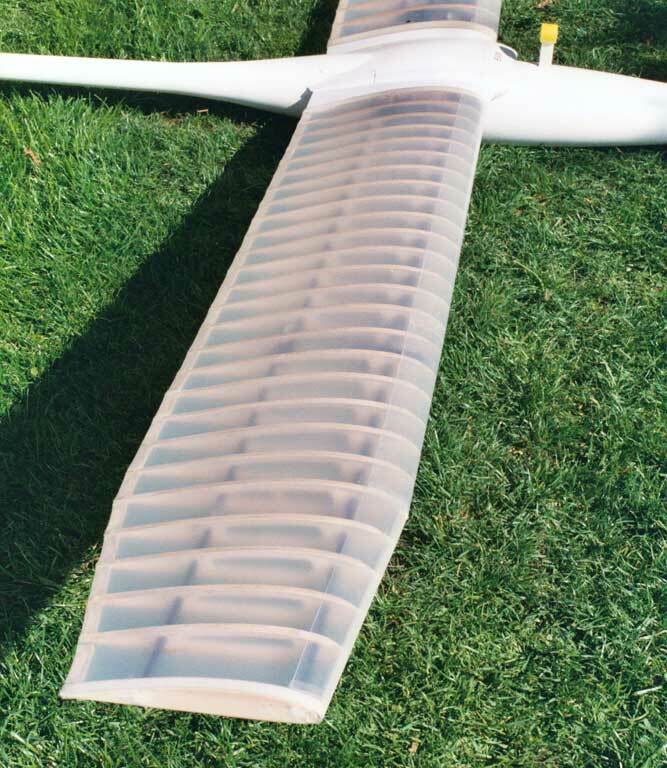 Wing framework of the model EV8 (2004), designed as an aeroelastic controlled articulated flapping wing, combined with a stroke amplitude expanding auxiliary spar of the hand wing at the wing tip section. The twisting elasticity of this flapping wing can be adjusted by the torsion of the auxiliary spar of the arm wing at the wing root. The downstroke twisting is slowed down by a dashpot. 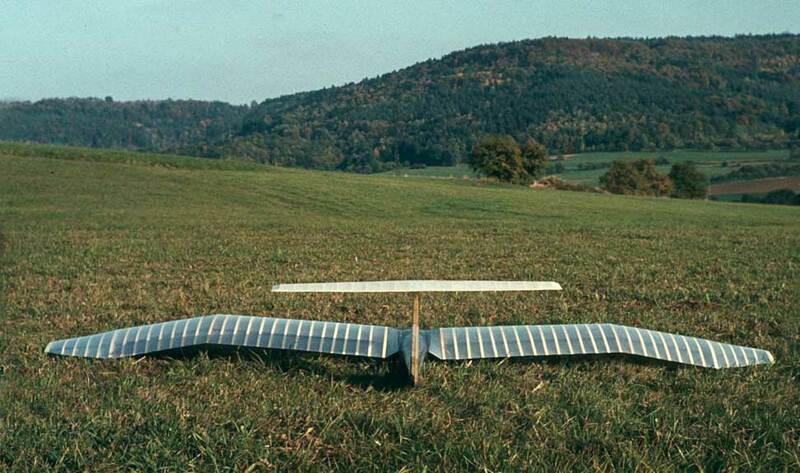 The twisting when gliding can be fixed by a radio-controlled servo. The downstroke twisting here corresponds with the theoretical guidelines almost to the wing tip (please also look at the picture which shows the wing structure in upstroke twisting position of the EV8). But still disturbing is the high mass moment of inertia of this flapping wing round its axis of flapping and twisting. In flight practice the articulated flapping wing has a big advantage. The bending of the hand wing in comparison to the arm wing depends on lift of the hand wing. At the same time it determines the distribution of the angle of incidence along the wing span. If the amplitude of the bending is estimable on flight pictures, the lift forces of the hand wing in comparison to the gliding flight can be estimated. Furthermore, the distribution of the angle of incidence in the moment of the picture was taken can easily be suggested (please look at EV6 and EV7). With these tow information's selective adjustments of the twisting moment of the flapping wing, the driving power and the cycle time ratio are possible. Especially flight pictures taken approximately in the middle of up- and downstroke are informative. Articulated flapping wings (in German, PDF 1.3MB). Informations and suggestions for a further development you will also find in the article Lift during wing upstroke, version 10.0, 2015 - 2018 (PDF 1.0 MB). As well as for the other EV-models also for the EV8 a 0.050 mm thick elastic polyurethane-foil was used as cover for the aforesaid wing. Double-sided adhesive tape was used adhere the foil to the wing framework (here still covered with release paper). 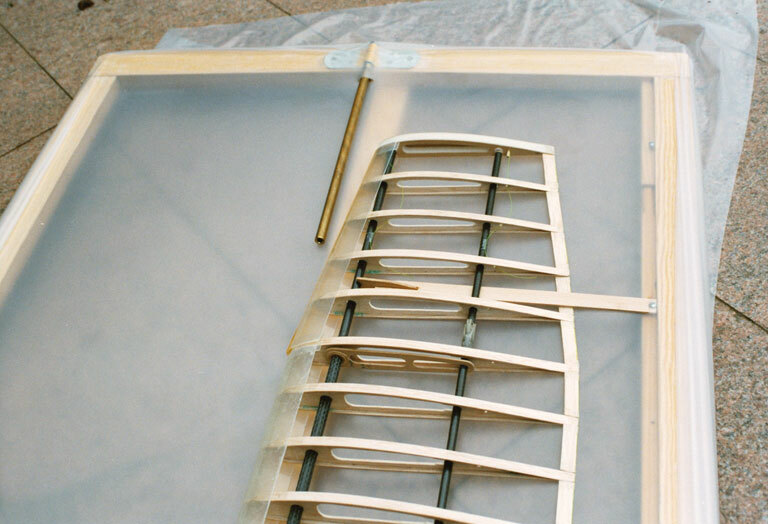 Version of a trailing edge for flapping wings, composed of a fishing line at the rear end of the airfoil which was wrapped with an adhesive tape. The displacement of lift along the wing which is required for flapping flight takes place mainly in the initial and final phase of wing upstroke (please see distances between the centres of lift). It is advantageous to support it by a sequence of suitable changes in the angle of attack of the various wing sections. A good way to do this is to bend the hand wing downwards. The constructional effort for a strong bending of the hand wing however, is only worthwhile, if a high climbing performance is aimed for the model. But it also looks good with a slow flapping motion. To put it somewhat simply, the bending of the hand wing begins and ends in birds with the beginning and end of the upstroke (please see Lift during wing upstroke, version 10.0, 2015 - 2018, PDF 1.0 MB ). If one inclines the axis of the hand wing from the back top to the bottom front, an increasing angle of bending is combined with an automatic increase in the angle of incidence (please see adjacent drawing). In this way, the angle of incidence changes self-acting in the desired direction at the beginning and end of the upstroke. This influence on the angle of incidence can approximately replace or at least complement the twisting of the hand wing during upstroke. In addition, the tip of the hand wing is slightly swinging backwards, although not so far as in the birds ( tip-reversal upstroke ). But they may use a similar operating mode of their wrists. 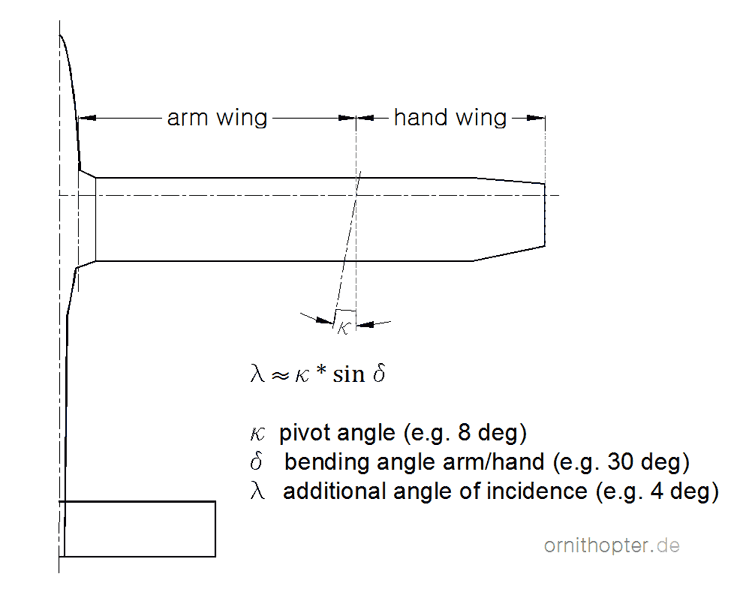 During the bending of the hand wing, its angle of incidence or angle of attack increases. Therefore te bending comes to a standstill already after a short upstroke motion. Depending on the upstroke speed, this is the case with a different bending. In this way, the maximum size of the bending automatically adapts to the beat frequency. The higher the beat frequency, the greater is the bending. Due to an additional pivoting of the wrist axis at the rear inwards, towards the span centre (see picture aside), the influence of the bending on the angle of incidence increases. This influence is reversed if the wrist axis is pivoted back outwards. In this way, if necessary, the angle of inclination of the axis, on the front to the bottom, can be made larger and thus also the swing of the flapping wing tip to the rear. Both axis directions can complement or replace each other. However, they have different effects on the wing surface in the wrist area. These axis inclinations can also be applied to simple membrane flapping wings. With the articulated flapping wings used so far, it has proven to be advantageous also to control the twisting of the arm wing by the passive bending of the hand wing. In the adjacent drawing, therefore, the fuselage near part of the wrist was approximately taken over from the above Aeroelastic controlled articulated flapping wing (according to Karl Herzog, the wrist of birds is also divided into two partial joints, a proximal ulnacarpal joint and a distal mediocarpal joint). The necessary twisting of the arm wing during up and down stroke is thereby already completely carried out during a small bending of the hand wing, in the close range of the stretched wing position (please see Pictures of the flying EV7a). If the hand wing according the drawing of the wrist bends further, the twisting of the arm wing remains unchanged. This behaviour of the arm wing has advantages in displacement of lift. 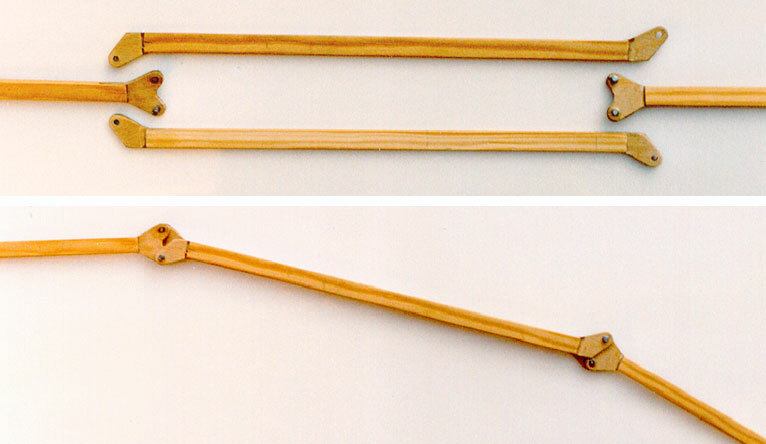 The motion of the spring rod should be blocked in the upper end position. Otherwise the moment of inertia of the hand wing will cause an overshoot of the angle of attack, like in the model EV7a. 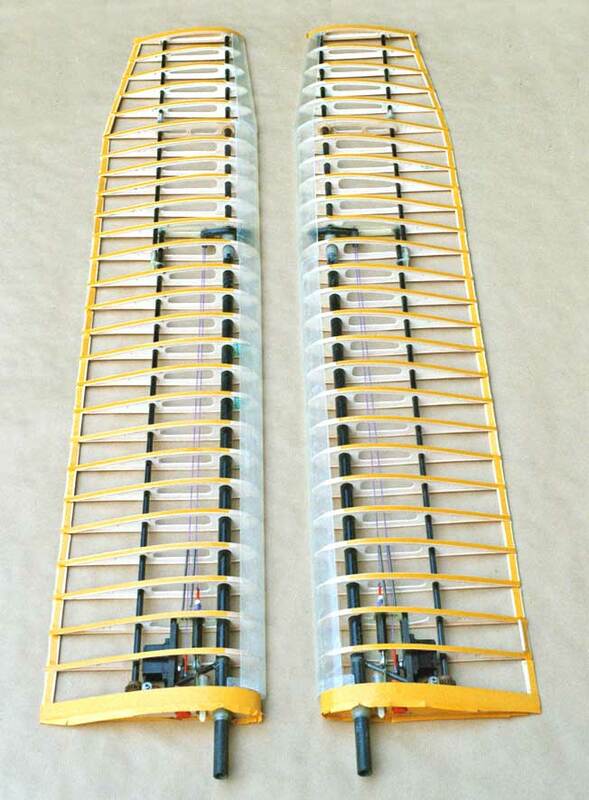 When reaches the wing the lower final stroke position, decrease the lift force in the outer wing section. The spring rod increases the angle of attack of the arm wing, at least close to the wrist. In this way, the arm wing takes over the lift of the hand wing. In the lower final stroke position, thus there is a strong lift for a short time. But also the angle of attack of the hand wing has increased during this time. Also with birds, not only the angle of attack of the arm wing, but also that of the hand wing is increased with rotation of the wing root in the lower final stroke position. But only with a rotation of the wing root the arm wing alone can absorb the whole lift for the upstroke. And only with a large lift of the arm wing are fully exploited the advantages of a wing bending. The large lift near the lower final stroke position supports the reversal of the flap motion of the whole wing. The angle of incidence of the hand wing, which has increased in the lower end position, becomes even larger in the course of its bending during upstroke. Due to the changing direction of its oncoming flow, however, this does not apply to its angles of attack. Along the hand wing will be occur a balance between positive lift close to the wrist and negative lift in the area near the wing tip, until the maximum angle of bending is reached (for example, like the course of the lift at the stretched wing during wing upstroke). Close to the wrist, however, its angle of attack is still increased. Together with the winglet effect of the hand wing, certainly a larger lift can be held together in the arm wing and concentrated in the centre of the span, than without a strong bending. When the arm wing reaches the upper end position, its angle of incidence at the wrist initially remains large due to the spring rod. Thus, without upstroke motion increases its angle of attack. After the upstroke motion, perhaps with wing rotation and thus increased lift in the span centre, the lift is shifted a little to the outside. In the following waiting time, until the hand wing is stretched out, the arm wing has a very large lift near the wrist (compare with the animation of the swan). This is supported by the winglet or end plate effect of the still angled hand wing. The advantage of the large lift in the opper stroke end position, is the missing wind turbine function with its negative thrust. Surely birds have such a possibility. Subsequently also the hand wing reached, without significant power generation, the upper final stroke position respectively the extended wing position. There, because of the increased angle of attack at the wrist, grow its lift and thus its force upwards. As the spring rod now gives way, the angle of incidence on the wrist becomes smaller at the same time. Thereby the hand wing takes over parts of the lift from the arm wing. This continues because the angle of attack of the hand wing increases further at the beginning of the downstroke. The motion sequence of this wrist thus supports the process of the lift displacement between the arm and the hand wings. In addition, the motion sequence of the two wing sections reduces the mechanical stress on the spar and the drive mechanism in the final stroke positions. The moment of inertia of the single wing sections is clearly smaller than that of the whole wing. But a good possibility to control the curve of the model or to influence the twisting or rotating of the hand wing is still missing.